Bridging design thinking with STEAM | Clarity Innovations, Inc.
A self-guided online learning experience to understand the role of design thinking in teaching interdisciplinary STEAM. littleBits makes it easier for non-engineers to prototype, tinker, and experiment with their own creations. Ayah Bdeir, Founder & CEO, believes in empowering the next generation to have the creative confidence and curiosity to always ask why. With littleBits, kids learn how to be more than just consumers of technology. They become inventors. Having found success with early adopters in education using their products, littleBits developed its first education-specific kit, the STEAM Student Set, for grade 3-8 classrooms. As a result, more schools and districts began adopting the product and asking for professional development to support its use in the classroom. 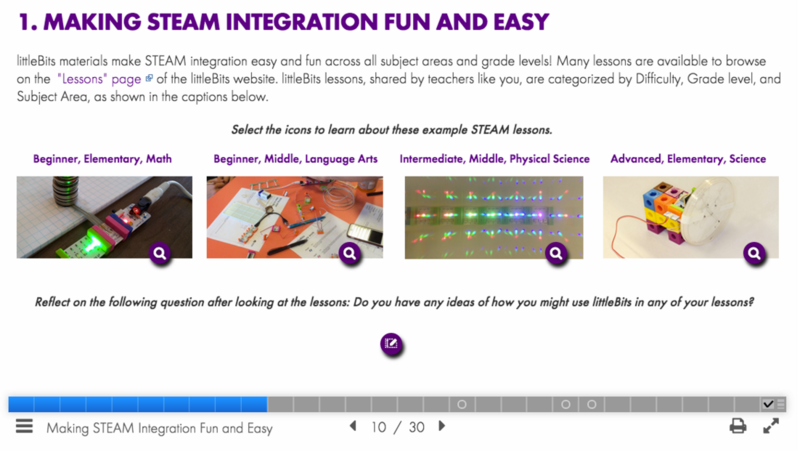 littleBits asked Clarity Innovations to help create an online professional learning experience to support large-scale implementation and help educators understand how design thinking is an effective interdisciplinary approach to teaching science, technology, engineering, arts, and mathematics ("STEAM"). Clarity developed the instructional design and learning objectives, wrote the script and on-screen materials, and produced the interactive activities in a five-part self-guided online workshop. The workshop provides hands-on time for participants to get familiar with the STEAM Student Set and the activities to be used with students. Throughout the experience, participants think through and develop an action plan for implementation in their classroom. After piloting an activity in their classroom, they earn a certificate of completion indicating the hours of professional development time earned through the five-part workshop. Since it's launch in 2015, hundreds of schools have used the online learning experience to improve their professional practice and better integrate design thinking into their interdisciplinary STEAM instruction.